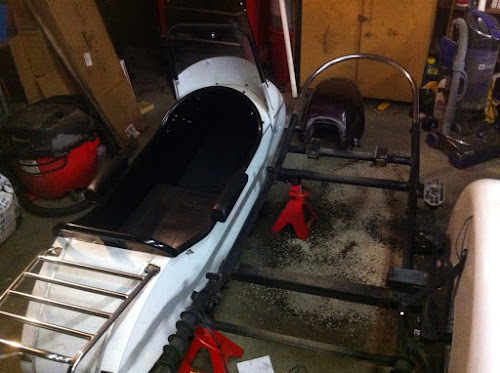 Last night, I tackled removing the front mount from the Cozy sidecar. Everything was pretty well covered with paint and I suspected that the mount wasn't going to just slide out. After loosening the two bolts on the bottom of the tube (two different size bolts), I then needed to use a large mallet to rotate the mount inside the tube. It was pretty well frozen in. I removed the plastic cap from the other side of the crossmember tube and poured in a bit of WD-40. There just happened to be a gallon can of the stuff that someone (not me) had picked up from somewhere. After only about five minutes, I was able to tap the mount free and now I have a WD-40 mess to clean up. The mount then breaks down into two pieces tied together with this flange and four bolts. I think that the only piece that I need to send in to DMC is the part that fits into the sidecar. The four bolts generic bolts (not grade 8) of two different sizes with no lock washers. I'm starting to see a trend here. Here is the other half of the mount getting ready to be shipped to DMC in a flat rate box. 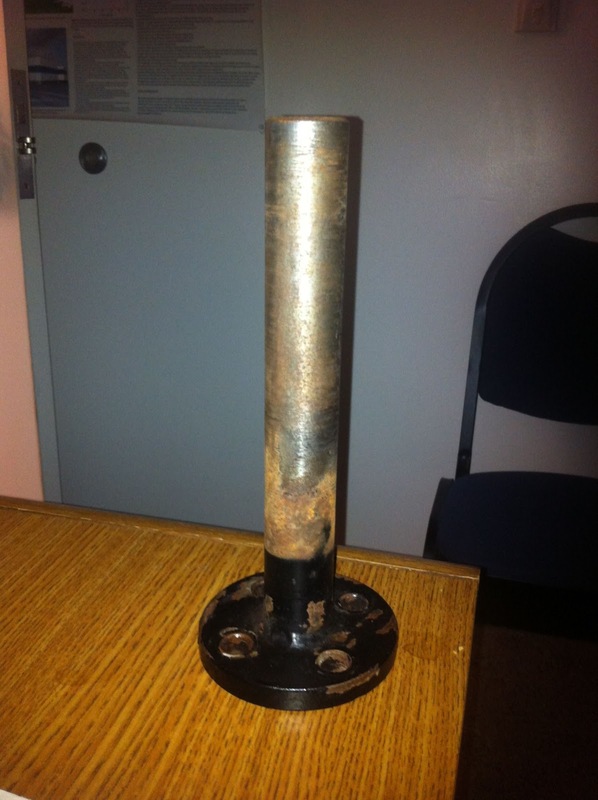 The shaft itself is solid steel, not just a tube like I expected so it seems to be strong enough though I would have made it a bit longer. 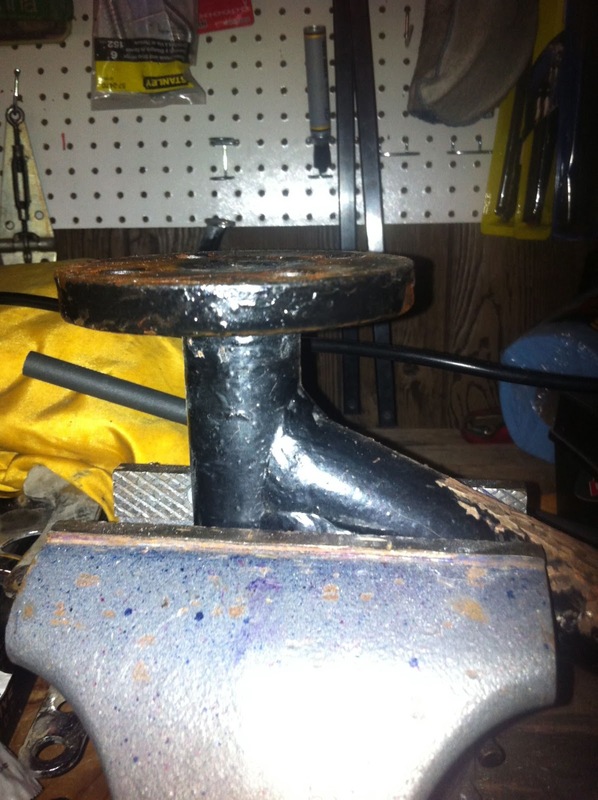 I think the flange will be cut off and another mounting system welded on. I am going to remove the tub and fender this week as a new rear crossmember made by DMC is going to be welded in. It will be convenient to be able to simply flip the frame over and not have to worry about scratching the paint, spatter or overspray. Monday Afternoon - I shipped off the part this afternoon and talked to Jay about what needs to be done. I think that waiting will be the hardest part of this project. Tuesday Morning - I pulled the body off of the frame last night. As some have mentioned in the many Internet forums, the Cozy is a bit on the "light" side for my bike. I read that the recommended sidecar weight is about 1/3 the weight of the bike. The Cozy Rocket is right at or slightly under the recommendation. As the curb weight of my R100RT is 567 lbs but thats without any load and the Cozy is listed at ~200 lbs. The smaller diameter tubular frame seems adequate but the stock mounting points really do seem minimal. with the exception of the front mount, the other mounting points for the struts are lugs which simply clamp onto the frame using a simple clamp with only a single bolt. I can see why Jay and others don't recommend using the Universal mounting kit that Cozy sells. The body is all steel and is held on by two rubber mounted clamps on the front cross member and the rear by six rubber rings, that need to be replaced. I heard that it is a bear to get the rings re-attached to the frame but I think that it will be much easier now that the body is off. Something to work on while I'm waiting for the parts from DMC. You can see the mess I made with the WD40 now soaking into the Oil-Dri absorbent granules. I have the body sitting on a mechanic creeper to make it easy to move around. I still need to remove the fender but was thinking of also removing the wheel as well again to make the frame easier to move around. This is the kind of activity that I find enjoyable. 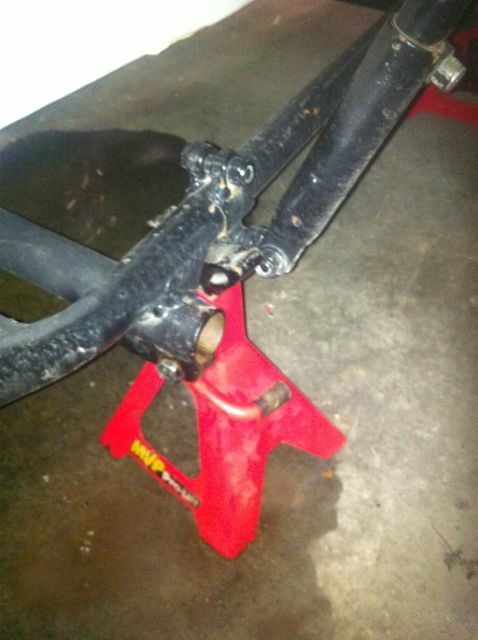 And based on the quality of their subframe as well as your experience with DMC, I'm confident that it'll be done right.. I can't wait to see it when it's done. You're not the only one, I can't wait to see it done as well! I am following along with interest. There is a Cozy locally that is attached to a Honda CBR125RR which I have taken photos of. See Dom's comment regarding weight. The seat bottom is bolted to the floor so you really are reclining as your legs would be straight out in front of you. Plus the width of the seat is 16" so they call it "cozy" for a reason. I'm thinking that I will be adding ballast to the frame between the body and the sidecar wheel for stability. Glad to see what's going on with the project. WD40 mess is no fun. Like some others and you I'm looking forward to the finished product. Cozy sidecars are also used on scooters. There are several blog posts that I've found that documented mounting them to Vespas. They fit the Genuine Stella and I've seen a couple of those rigs here. It seems even without a "monkey" their performance is, shall we say, deliberate. There is one guy who replaced the 150 in his Stella with a 200cc Vespa engine. He said that worked a lot better for him, but still he referred to his progress as plodding along. I have been among the missing for a while. So you have joined the legion of the three wheels two? I am going to have to scan past blog episodes of yours to determine what is going on here. It's an option for extending the riding season plus you can carry additional coal and it's a handy way for carrying a shovel. After all, you say these airheads are coal fired.